The White House wants North Korean leader Kim Jong Un to commit to a timetable to surrender his country’s nuclear arsenal when he meets President Donald Trump next week in Singapore, a high-stakes summit that could last as long as two days -- or just minutes. Trump has been advised not to offer Kim any concessions, as the White House seeks to put the onus on the North Koreans to make the summit a success, one U.S. official said. The president is determined to walk out of the meeting if it doesn’t go well, two officials said. Alternatively, Trump is toying with the idea of offering Kim a follow-up summit at his Mar-a-Lago resort in Palm Beach, Florida -- perhaps in the fall -- if the two men hit it off. 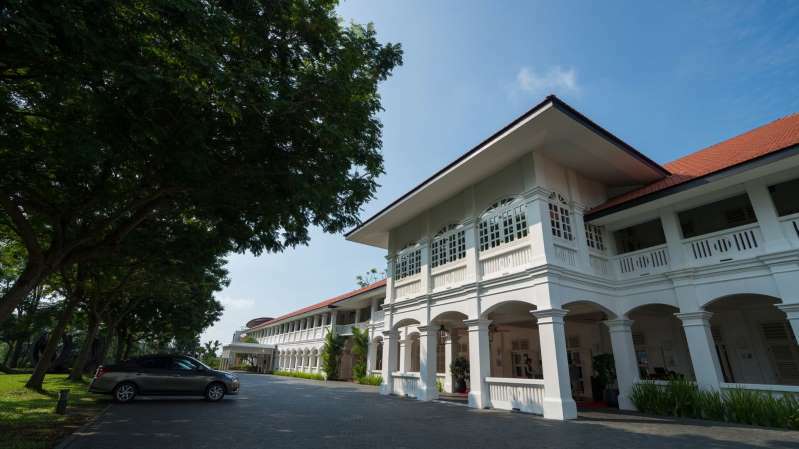 The Capella Hotel stands on the island of Sentosa in Singapore. Pompeo, who has traveled to Pyongyang twice since March, has prepared Trump for the summit in about eight-to-ten hours of briefings per week for several weeks, two U.S. officials said. The CIA’s Kim has usually joined him. On Tuesday, former senators Sam Nunn and Richard Lugar briefed Trump and Pence on their lessons learned co-sponsoring a law aimed at securing and dismantling nuclear weapons after the fall of the Soviet Union. Trump’s aides consider him ready for a summit in which the White House believes he holds an advantage -- while 12 hours ahead of Washington, Singapore is a Westernized metropolis and will be the farthest Kim Jong Un has traveled since taking charge of his country in 2011. Frustrated after the North Koreans cut off communications for about five days last month and snubbed Hagin at a preparatory meeting in Singapore, Trump canceled the summit on May 24. Talks resumed, however, and Kim dispatched an envoy -- his spy chief Kim Yong Chol -- to Washington on Friday to deliver a letter to Trump. --With assistance from Keith Zhai and Nick Wadhams.